Finding guest blogging opportunities can take a lot of time if you don’t set up the right process in place. I’m not talking about the “spray and pray” method, but actually getting to write for quality websites that fit your niche, get traffic and will help you build your brand and audience. 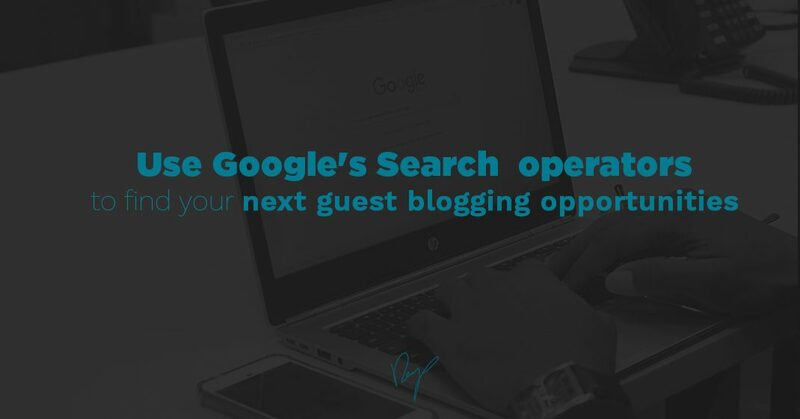 In this post, I want to share with you a method you can use to find tons of guest blogging opportunities by leveraging Google’s search operators and a simple hack to organize all your new opportunities in minutes. If you’re reading this blog post, I’m guessing you’re not new to why you should guest blog. Guest blogging is the best way to generate quality backlinks from relevant and respectable sites. If you’re looking to establish thought leadership, writing for other leading publications in your industry is a great way to go. By showing that they trust you, their followers and other leading players in your field will trust you as well. It doesn’t matter if you’re writing to a site that has 20k readers a month or 500k, as long as it’s not the same readers you get on your site, there’s benefit to it. So great, you’re sold and excited to start writing for every relevant site in the world! But Before you go into the process, you have to remember that not all guest blogging opportunities were created equal. You have to make sure the ones you choose are a good fit for your marketing and brand goals. But that’s a whole different topic we will cover in another blog post soon. Do you share the same target audience? How much traffic is the site getting? (You can use SimilarWeb for this). Domain Authority (you can use Ahrefs or SEM rush for that). Now, let’s move on to finding good blogs in your niche that accept guest blogging. There are many ways to find great guest blogging opportunities. Each option has its different tricks to make the most out of, and of course, speed up the research process. You’ll also get different results from each, with its own pros and cons. Today, I want to focus on how to find the best guest blogging opportunities with Google Search Operators. I think Google Search operators are almost a secret gem when it comes to doing smart marketing research. There are so many great strategies to obtain useful information in making your research life easier, that it’s almost a crime not to leverage them. In the next section, I will share with you how to use those operators to research and find niche blogs that accept guest contributions and you can actually start pitching to in the following week! 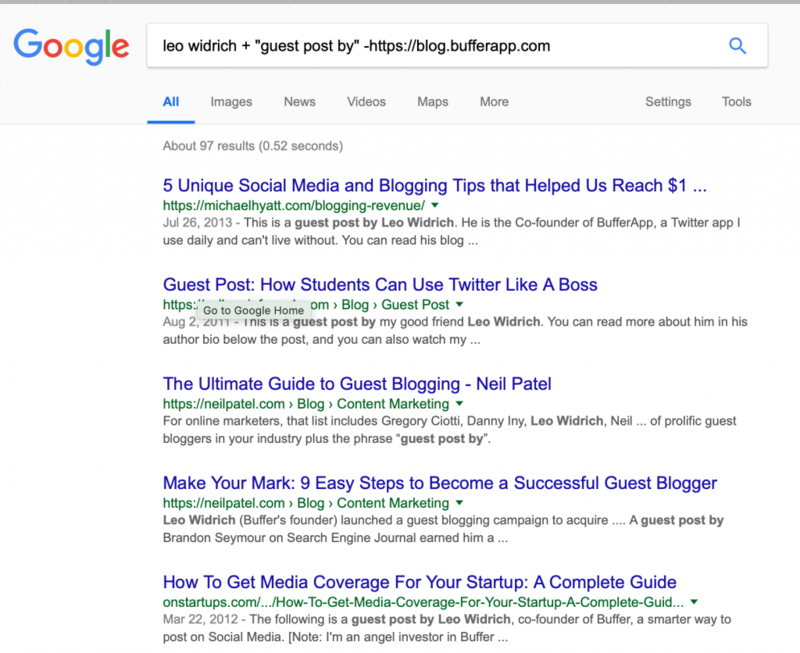 How to leverage Google Search Operators to find guest blogging opportunities. 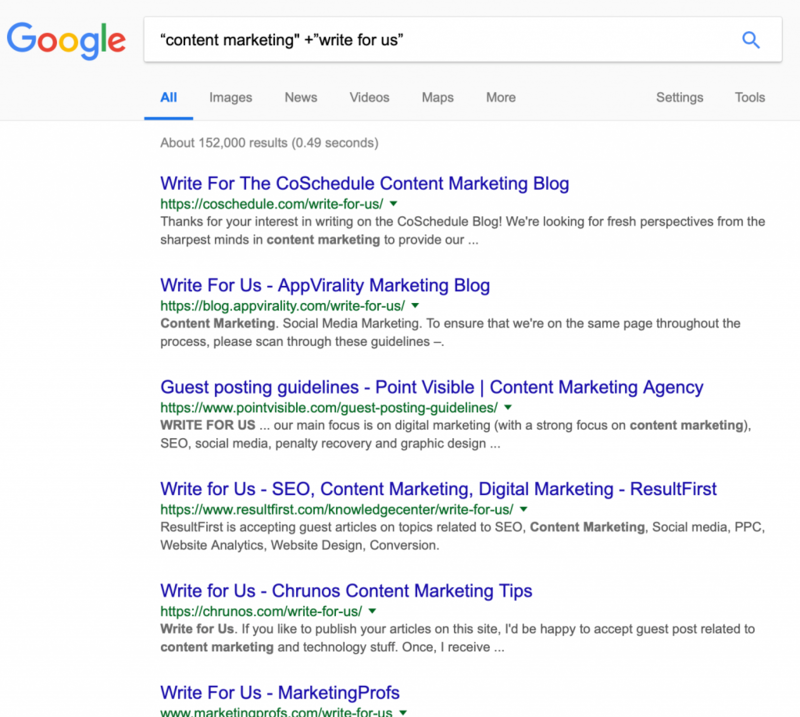 The idea behind leveraging Google’s search operators is to think about what is the potential keyword a site would use to describe the guest posting opportunity. Sites that are open to idea but don’t promote it. Analysing where your competitors / favourite marketer’s write. Bonus: A nice URL trick for .edu and .org sites. How crazy is that you can so easily pitch giants like CoSchedule and Marketing Profs, right? Note: When you search for your competitor’s or hero’s guest posts,, it’s important to add -“site url” in order to filter their original content. For example, one of my favorite content marketers is Leo Widrich, co-founder of Buffer (though not in Buffer anymore). Leo wrote so many blog posts for Buffer’s blog, that if I’ll search for his name with any combination of keywords, I’ll probably get results from Buffer’s blog. This is where adding the “-site url” comes in handy. 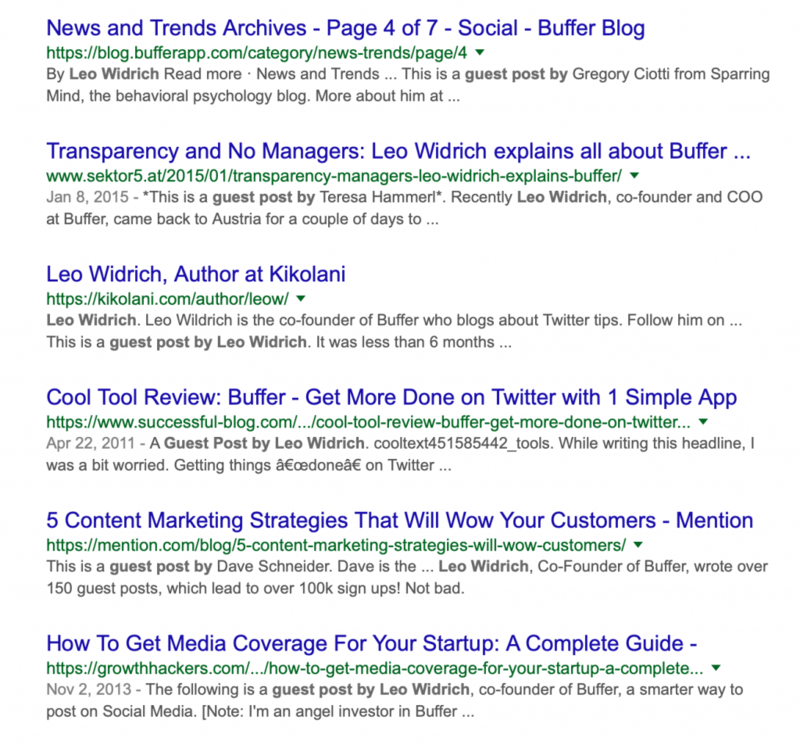 This makes sure I’m getting the results for the “”leo widrich + “guest post by”” search, but the “-https://blog.bufferapp.com”” tells Google, that I don’t want to get any results back from this specific URL. It’s not bulletproof – but 99% of the results will be exactly what you were looking. Bonus: Looking to get links from edu, orgs, etc? I hope you took a second to try out some of the search operators I just showed you and you saw for yourself how many opportunities are there. Seeing all this search results (and I’m guessing you only saw page one, right?) Can be overwhelming. But I want to share with you a hack and template we use to manage this process in seconds. 2. Use the template we use to manage our client’s guest blogging opportunities. To get these resources for free, all you have to do is click hereand join the ‘Growth Toolbox’ and get the link to your email. It doesn’t matter what niche you’re in, there are tons of blogs you can contribute to if you want to build authority or brand awareness, it’s just a matter of having the right methods to find and prioritize them. Let’s take this opportunity and make it fun, leave your blog name and URL and niche in the comments – so other readers know you’re accepting guest blogs, and make it easier to help each other find quality opportunities and great content.